In 1940 Noah Flug is 15 years old. Each day he risks his life as a member of the youth underground organization in the Lódz Ghetto. Why? Because from 1940 onwards this teenager has only one goal: to do everything in his power to bring down Nazi Germany. 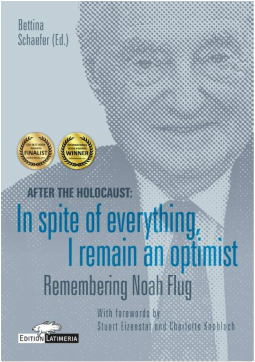 Twenty-six eyewitnesses from Israel, Poland, Germany and the USA relate Noah’s struggles and his life after surviving concentration and extermination camps. In in-depth conversations with Bettina Schaefer, his family, friends and companions remember a person who, despite everything, optimistically looks towards the future. And his positive outlook is dependent on the Holocaust survivors and forced laborers under the Nazi regime receiving a minimum amount of what is justly due to them.